This is the story of David and Goliath as seen from Goliath’s side of the Valley of Elah. Quiet moments in Goliath’s life as a soldier are accentuated by Tom Gauld’s drawing style, which contrasts minimalist scenery and near-geometric humans with densely crosshatched detail reminiscent of Edward Gorey. 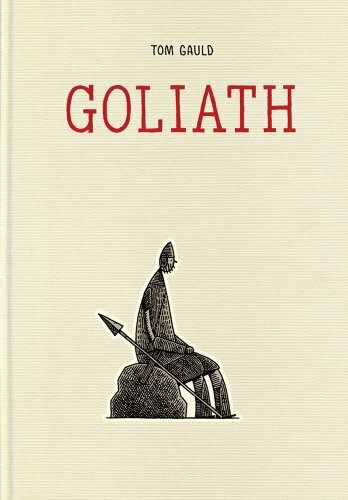 Goliath’s battle is simultaneously tragic and bleakly funny, as bureaucracy pervades even this most mythic of figures. Goliath displays a sensitive wit, a bold line, and a traditional narrative reworked, remade, and revolutionized. I hope he used Photoshop for those cross-hatched skies.